PARALLELS // Part 2 presents recent work by Joshua Albers and Yhelena Hall. Interested in the physicality of the human body, each artist presents an investigation of the relationship between experience and perception. Joshua Albers’ work explores the combinatorial nature of perception when it is enacted through information technology. He examines methods of mapping the shape of information to facilitate an understanding of human perceptual experience. Yhelena Hall’s interest the human desire to fly inspired her project, Un-distant Flights. 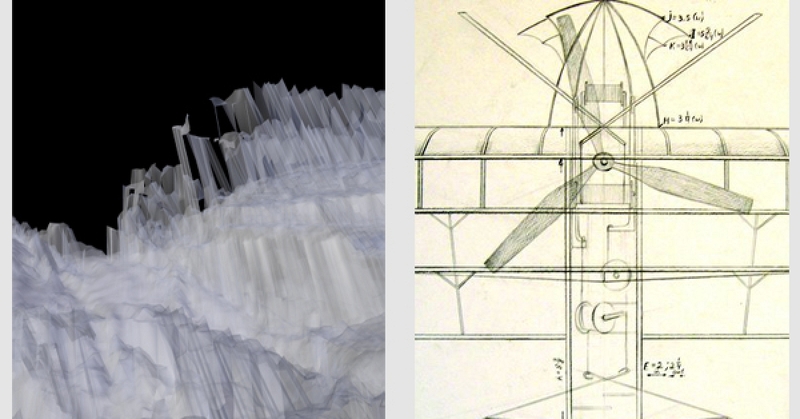 Incorporating both video and a three-dimensional model of a bizarre flying machine drawn from pre-Wright Brothers aviation history, the piece sits at the intersection of reality and imagination, and brings the experience of flight to the viewer. JOSHUA ALBERS received his BFA from Missouri State University and recently completed his MFA in New Media Arts from University of Illinois at Chicago. Albers uses information technology to investigate the nature of constructed realities and rendered environments. His recent work explores the poetic potential of re-purposed consumer hardware, principally the Microsoft Kinect. He lives and works in Chicago, IL. YHELENA HALL was born in Kamianets-Podilsky, Ukraine. She studied painting at the Kharkiv State Art College and received a Fulbright Scholarship to obtain her MFA in Sculpture at the State University of New York at New Paltz. Hall is interested in the process of transformation and uses various raw and manufactured materials to explore the relationship between space and identity. Hall’s intricate structures employ natural phenomena to evoke contemplation of common architectural forms. She lives and works in Chicago, IL.